In case you’re wondering what Barack Obama might look like with a small engine or wind farm on his head … after being attacked by the Evil Spellbinder in the employ of certain right-leaning but largely illiterate online communities … well, just go read this for your morning moment of hilarity. 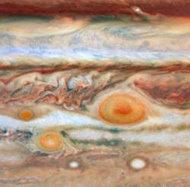 A third red spot has erupted on Jupiter. Jupiter, speaking as a forty-something who still gets acne, I feel your pain. Do they make Clearasil in a planet-sized tube? Beavers are being reintroduced into Scotland 400 years after being hunted out of existence. Welcome home, beavers! Say there, speaking of beaver-free zones, there’s a new book out about Raymond Burr’s secret gay life and you can read a very dishy excerpt here. For some reason I’m a sucker for these Hollywood closet stories … maybe because they had such roomy and glamorous closets in those movie-star mansions. If there’s an epidemic of people pretending to drown at Coney Island, you’ll know why. Heck, I might try it myself. And from the warming plate, some older items I didn’t get around to posting when they were still fresh, marked down to half price. Russell T. Davies, the man who regenerated Doctor Who, has formally announced that he’s stepping down from the show after next year’s specials … but fear not. The show will be in the very capable hands of Steven Moffat, the multiple-Hugo-winning writer who’s already brought us a lot of the show’s very best episodes, including The Empty Child, The Doctor Dances, The Girl in the Fireplace and Blink. Feel-good story of the past month: triumph of a gay homecoming king. Other feel-good story of the month: bionic dolphin! The Hillary Clinton versus Monty Python “flesh wound” mashup video is worth a giggle. Finally, speaking of video, if you haven’t seen the video of Ellen nailing McCain to the wall about marriage, while he sits there squirming, it really is riveting. I don’t get that. I see someone trying to disagree as politely as possible with someone he clearly likes. Add to that the added pressure that he’s trying to avoid creating a soundbite that could be embarassing, especially if taken out of context, I think he was pretty poised. I am no McCain fan, but he seems to be trying very hard to be a good guest.